Mary Alice Monroe invites you to meet five remarkable characters as she explores the power of friendship with tenderness, honesty and understanding. On the surface, it is a monthly book club. But for five women, it is so much more. For Eve Porter, whose husband's sudden death cheats her of every security she had planned on, the club is a place of sanctuary. For Annie Blake, a brilliant attorney intent on starting a family late in life, it is the chance to finally let down her guard and dream of other possibilities. For Doris Bridges, it is her support group as she acknowledges her dying marriage and finds the ultimate freedom in her husband's betrayal. For Gabriella Rivera, the "perfect" wife, mother and friend who offers support to everyone but is afraid to ask for it herself, it is a sense of community. And for Midge Kirsch, an artist who has always lived her life against the grain, it is a haven of acceptance. They are five women from different walks of life, embracing the challenge of change. And as they share their hopes and fears and triumphs, they will hold fast to the true magic of the book club--friendship. "Monroe offers up believable characters in a well-crafted story." --Publishers Weekly. "With its evocative, often beautiful prose and keen insights into family relationships, Monroe's latest is an exceptional and heartwarming work of fiction." 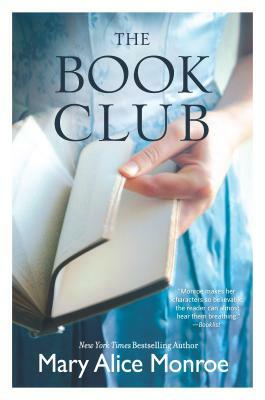 "The Book Club skillfully weaves the individual story threads into a warm, unified whole that will appeal to readers who enjoy multifaceted relationship novels with strong women protagonists." "Skyward is a soaring, passionate story of loneliness and pain and the simple ability of love to heal and transcend both. Mary Alice Monroe's voice is as strong and true as the great birds of prey of whom she writes." "Readers who enjoy such fine southern voices as Pat Conroy will add the talented Monroe to their list of favorites." "Monroe writes with a crisp precision and narrative energy that will keep [readers] turning the pages. Her talent for infusing her characters with warmth and vitality and her ability to spin a tale with emotional depth will earn her a broad spectrum of readers, particularly fans of Barbara Delinsky and Nora Roberts."